Up for sale are 25 rounds 454 CASULL ammo, "Viper" Class; NEW, professionally loaded by American Custom Ammo. 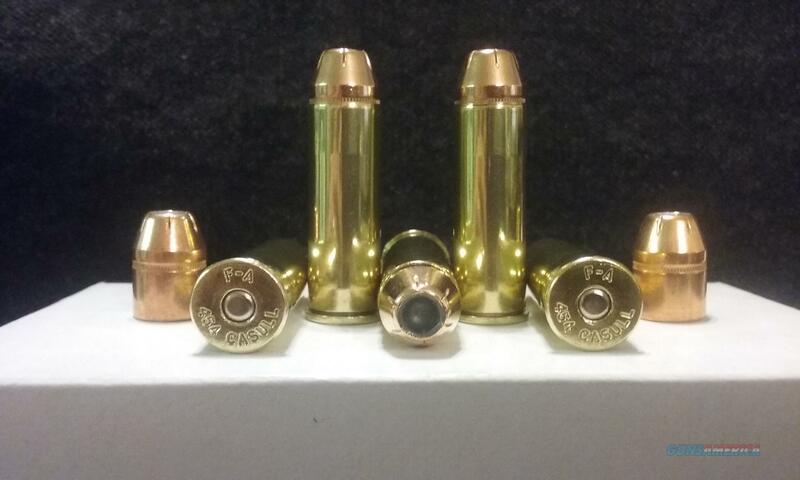 Utilizing 250 grain Hornady - XTP .452 diameter, Full Profile Jacketed, Hollow Point, Flat Base bullets. Velocity is approx. 1298 F.P.S. out of a 9.375" barrel with a 1 in 24" twist. Brass is new, properly headstamped - Freedom Arms (F-A) and is Boxer (small rifle) primed thus allowing it to be reloadable. This is NOT vintage ammunition. It is NOT corrosive. This ammunition is ONLY for use in properly functioning firearms chambered in 454 Casull, known to be in good condition. This ammunition may also be fired in properly functioning 460 S&W Revolvers, known to be in good condition. Thank you for supporting this AMERICAN MADE product. Additional loadings are available upon request. You MUST be 21 years of age or older to purchase this ammunition! NOTE: Load is somewhat moderate due to the type of bullets used. ATTENTION!!! Shipping cost is NOT included!! !